Over the years, my college friend, Casey has visited us twice in Honolulu and even once in Seoul, yet we had never once visited him in San Francisco. We finally had a chance to get out there this year, and he showed us the sights and introduced us to some of the amazing and diverse food and drink the city has to offer. The hills! San Francisco is famously hilly, and it was a lot more extreme than I remembered. There are a LOT of one-way streets. Very efficient, but exceedingly difficult for newcomers to learn. Google Maps is your friend (and indeed, I'm sure this is exactly the environment it was developed for and tested in). Parking is difficult. Not only because it's scarce, but also because it's almost all parallel (street parking). People here are incredibly good at parallel parking. Just amazingly, fantastically good at it. Anyway, the food was obviously well worth these braving these minor obstacles. Our pizza came loaded with ripe, roasted tomatoes, spinach and lots of fresh cheese. 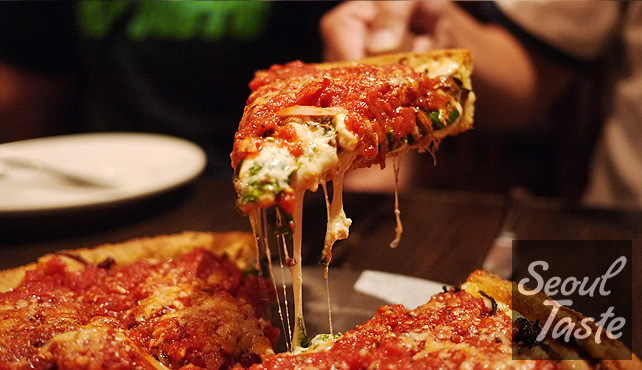 With this kind of pizza, one slice is enough for many, and two slices would be a big meal. I think I had three. 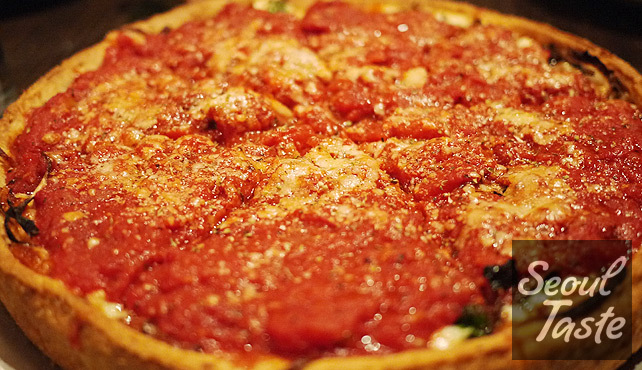 It was Annie's first time trying deep dish pizza, and I hadn't had it for quite some time either. Little Star's rendition was easily the best I've had, and for Annie it was a revelation. As a result, we are now on the hunt for good deep dish pizza in Seoul, and I am also on the lookout for a pan, so that I can try to make it at home as well. If you have any leads on either of those, please comment below! In addition to food, Casey was also on a mission to introduce me to great local beers, mostly IPAs (india pale ales), since he knows they're my favorite. Right from the start, he recommended a Racer 5 IPA, and sure enough, it proved to be my favorite from the trip. Unfortunately, I doubt I'll be able to have it again until my next trip to San Francisco. 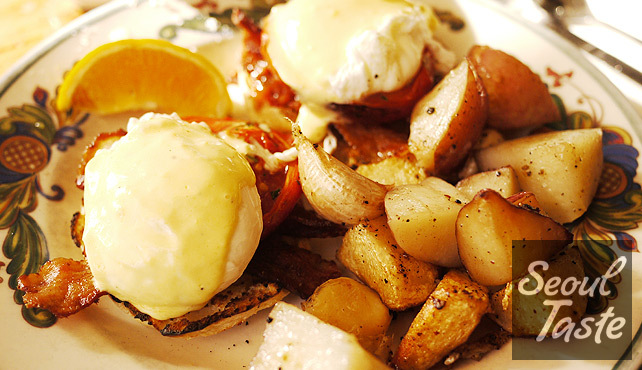 Zazie - Poached eggs with English muffin, bacon, tomatoes and home fries on the side. The following day, although we were not entirely sure we had finished digesting the previous night's meal, we started the day right with breakfast at Zazie. Although Annie and I have a lot of differences of opinion when it comes to our favorite meals, we are in agreement when it comes to the ideal breakfast/brunch: eggs benedict! Zazie, with a full page of poached eggs-based dishes on the menu, is now pretty much our favorite breakfast place. The food fully makes up for the somewhat cramped seating and the less-than-quick service, and we actually returned there on our own toward the end of the trip. I'm not a big fan of oyster shooters myself but Casey and Annie bought some from one of the vendors lining the pier across from Boudin's. As in Korea, there are many vendors gathered in the same area selling basically the same thing, it's hard to distinguish between them. 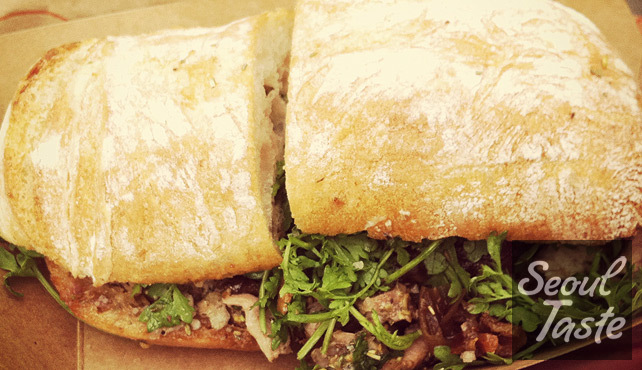 Gourmet food trucks (don't call them lunch wagons!) are a big thing right now throughout the U.S. A year or two ago, they used to rove around the neighborhood alone, but nowadays you'll often find them gathered together at lunch or dinner time in a sort of outdoor food court. 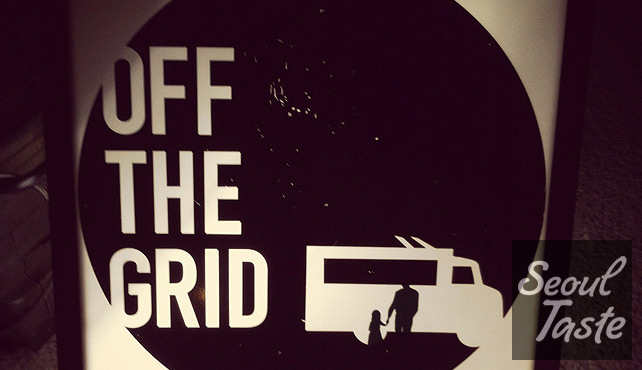 In San Francisco, "Off the Grid" seems to be the most serious of these gatherings. 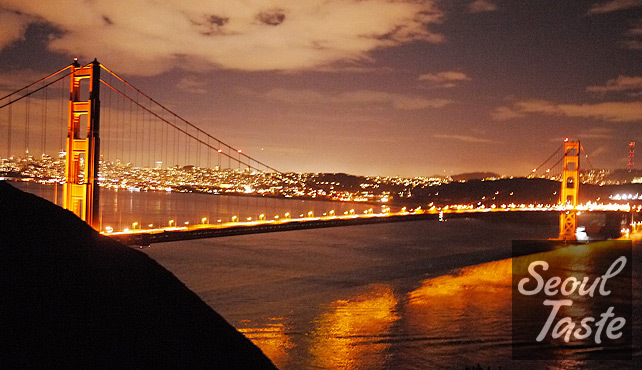 They organize a number of weekly events, the biggest of which is at Fort Mason on Friday nights. This is the one Casey took us to. We enjoyed many things, from the kalbi tacos that have been in the news so much, to incredible fish tacos, to desserts. This one really took the cake though. The "Notorious P.I.G." 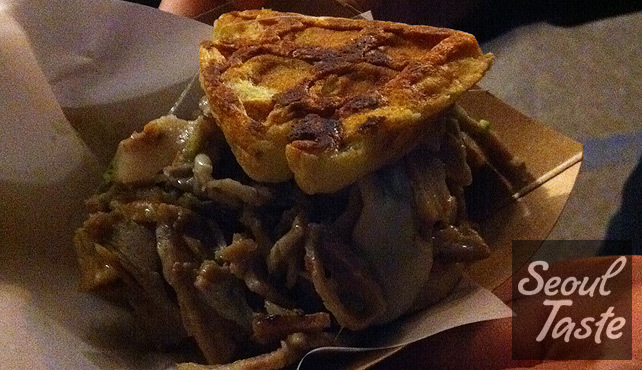 as they called it, was a Cuban sandwich, stuffed with massive amounts of pork and cheese, with waffles as the bread. Whoa. It was incredible, and I kinda wanted another, but thought it might just kill me on the spot... so I had another fish taco instead. Say Cheese is a deli that, as you might guess from the name, takes pride in providing an especially grand selection of cheeses (another thing that's especially difficult and expensive to procure here in Seoul). 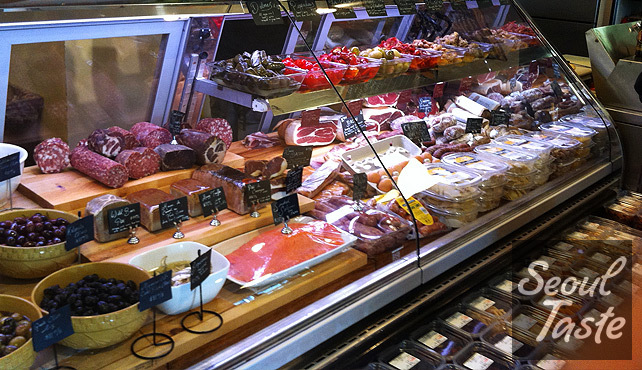 They offered a number of sandwich choices, or you can mix-and-match any of the myriad deli meats, cheeses and breads in their inventory. As it turns out, the fat content of the Notorious P.I.G. was nothing compared to this. At the ferry building farmer's market, we stood in a long line in front of Roli Roti's booth, where pork roasting on spits like rotisserie chicken was sliced on the spot to make porchetta sandwiches. These sandwiches were positively loaded with grease, even the bread, which they used to sop up the abundant oil left behind on the cutting board after slicing the pork. As if that wasn't enough, below the slowly turning spits sat potatoes, placed there to cook while soaking up the drippings from the pork. We ordered some of those, too, but sadly they weren't as good as I was expecting. 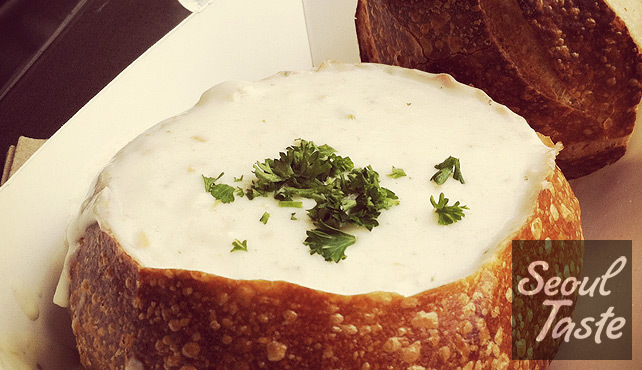 I'd pass on the potatoes, but I'd gladly stand in the long line again for the sandwiches! Pork fat is good for you, right? Anyone who's had coffee both in Seoul and in the U.S. can relate to the incredible price difference. At Starbucks, a regular cup of coffee is $1.50 in Honolulu (a city not known for low prices), yet 3300원 (~$3) in Seoul. And although Seoul coffee quality has been improving over the years, there is still often a disparity in quality as well. Thus, in addition to food and beer, we also enjoyed a lot of coffee on our trip. 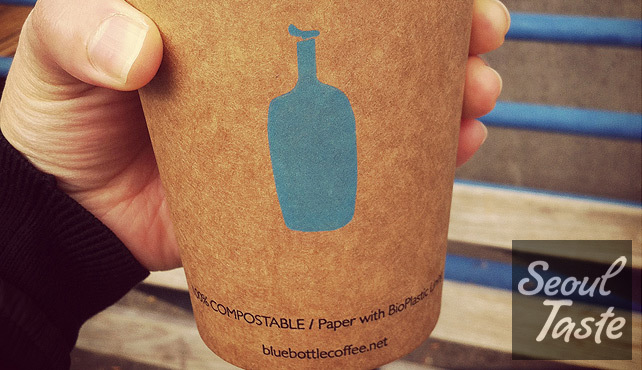 Even San Francisco's specialized indie coffee shops, like Blue Bottle and Contraband, seemed inexpensive to us. At a different Blue Bottle location, I had my first taste of what they call Kyoto-style iced coffee. It's cold brewed, as in steeping for hours at room temperature or in a refrigerator, as opposed to pouring hot-brewed coffee over ice, but with a twist. Using an intricate (and apparently, expensive) system of custom glassware that looks like it came out of a futuristic science lab, water is passed through grounds at a rate of one drop per second. Needless to say, coffee brewed in this manner is expensive (by U.S. standards at least, at about $4.50) but the flavor was indescribable. A single sip yielded a series of intense flavors that continued on long after the coffee itself had left my tongue. Naturally, I am now on a mission to recreate this at home as well. 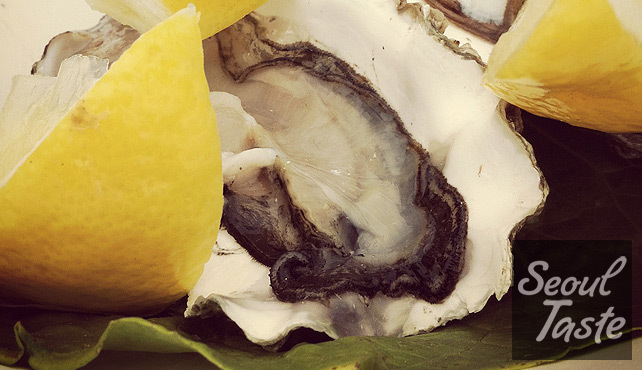 On Sunday, we took a mini road trip up to wine country, in this case, Sonoma Valley. 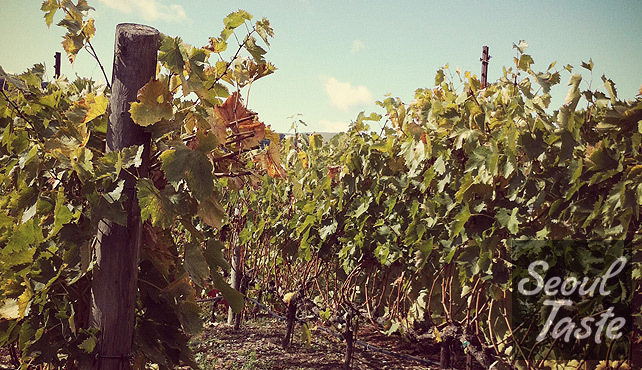 (Napa is more well-known, but that only means it will be more crowded and expensive.) We don't know much about wine, so we'll refrain from posting our impressions and tasting notes here, but we did enjoy the experience (in this case, it was a first for both of us!) and we even went on a tour at one of the wineries, where I learned quite a bit about winemaking, and how much a seemingly simple barrel goes for these days (about $1,000!). On the drive back, before crossing over the Golden Gate Bridge, we took a little detour up a hill to snag this picture of it first. Many thanks to Casey for showing us a great time in his city!